It was two o’clock on a Friday afternoon. 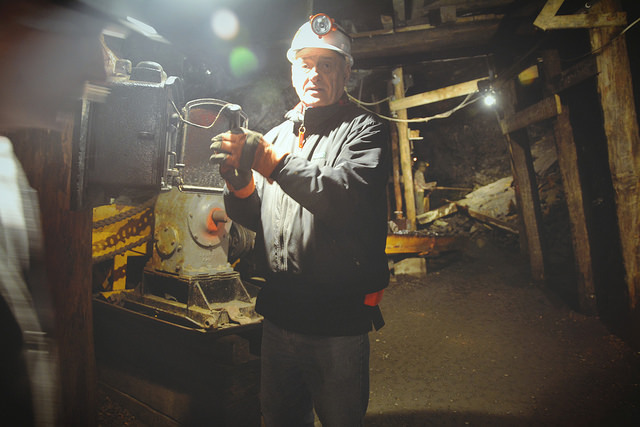 Bob Lucas, a former coal mine worker, put on a white helmet with a lamp and boarded a yellow mine train. As a tour guide in the Lackawanna Coal Mine on the outskirts of Scranton, he was taking a group of ten visitors 300 feet below the surface through a steep tunnel. The hundred-year-old coal mine was once the largest in Pennsylvania. As the last operating coal mine in Scranton, it was closed in 1966 when the owner went bankrupt, and abandoned for 20 years before reopening to the public as a tourist attraction. Some 3,000 audience members at the Lackawanna College gymnasium applauded and cheered when he said “coal” and “work”. The coal industry had paved the way for the city’s glory days in the late nineteenth century, when immigrants flooded into Scranton to work in the mines and made the city Northeastern Pennsylvania’s industrial heart. It began shrinking after World War II due to increasing environmental concerns and the introduction of alternative energy resources. Wals’s grandfather was one of those “breaker boys” working in mines. As child laborers, their job was to pick out impurities from coal. He died of the Black Lung – a typical disease among miners who were exposed to a dusty, polluted environment. When Lucas showed visitors around in the underground mines, they found it was far from a pleasant job. They had to watch out for rocky passages and dropping water, endured unpleasant smells and the constant chill of 53 degrees. Lord said her family stopped burning coal at home years ago, because it became more expensive than natural gas. As coal gradually lost favor to oil and natural gas as a heating fuel in 1940s, the fortunes and population of Scranton began to diminish. In 2015, natural gas overtook coal as the top source of U.S. electric power generation for the first time, according to market intelligence firm SNL. After finishing his last tour of the day, Bob Lucas headed home. Once the owner of a small coal mine near Scranton, Bob worried the coal industry was dying due to the government’s strict environmental regulations.